I never really got into the socks and sandals craze...if it doesn't look good on a fifty-year old man mowing his lawn it doesn't look good on you. Despite what JCrew and Anthro will lead you to believe, very few of us could pull that off in a fashionable way. Enter Miu Miu. 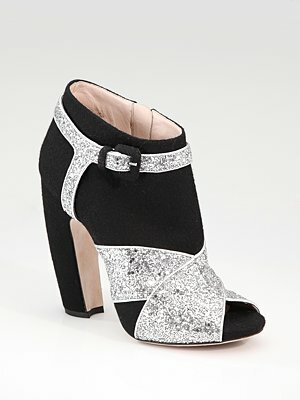 I love how this shoe explores this trend in a fresh and most importantly blingy way. I will be on the hunt for these. If you get wind of any sales let me know. Stay Posh!